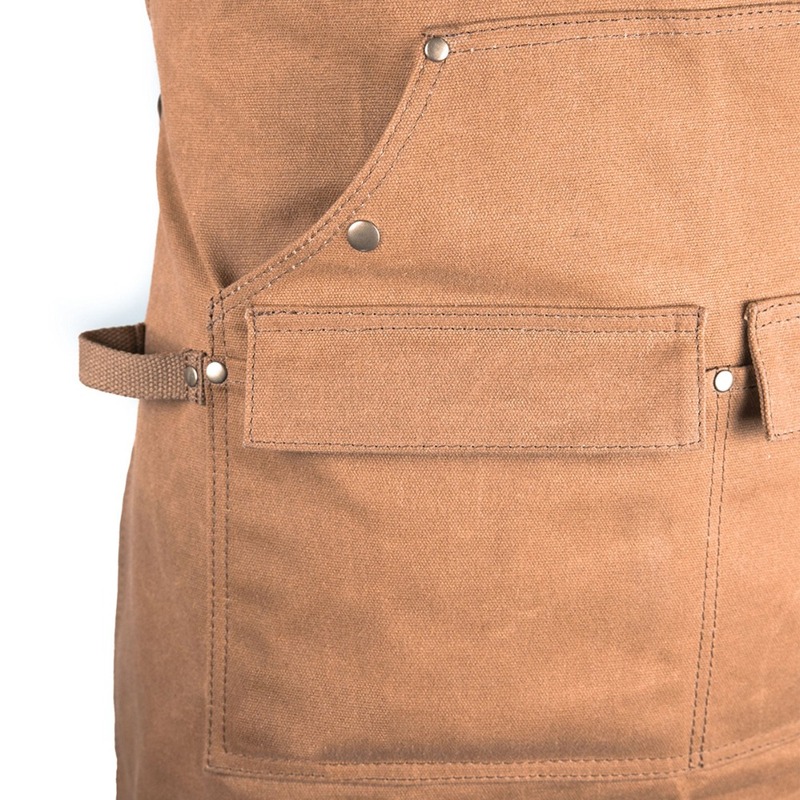 DURABLE GOODS brings high-quality work aprons to the common folk with top-notch service & support. We believe in products that are built to last. Whether you are a woodworker, barista, blacksmith, or grill-master, we recognize you take your craft seriously and your tools are no joke. We get it though, the boutique quality stuff is really expensive, so we focus on durable materials and functional designs, with no excess frills, to give you a lot of bang for your buck. Why not protect your wallet while protecting your clothes, right? 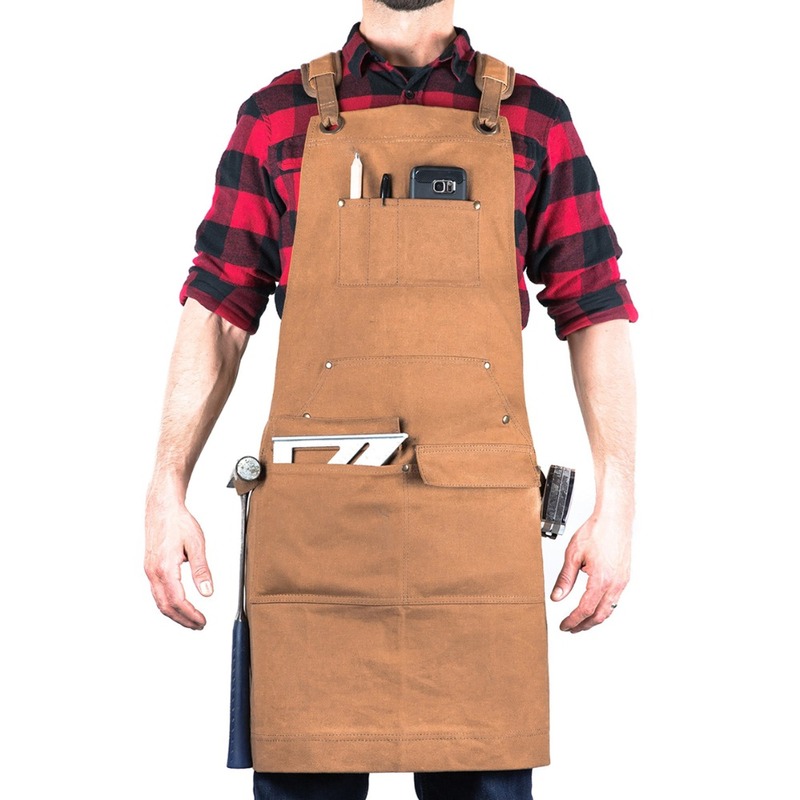 WOODWORKER EDITION: Our flagship work apron updated for the woodworking enthusiast or pro. 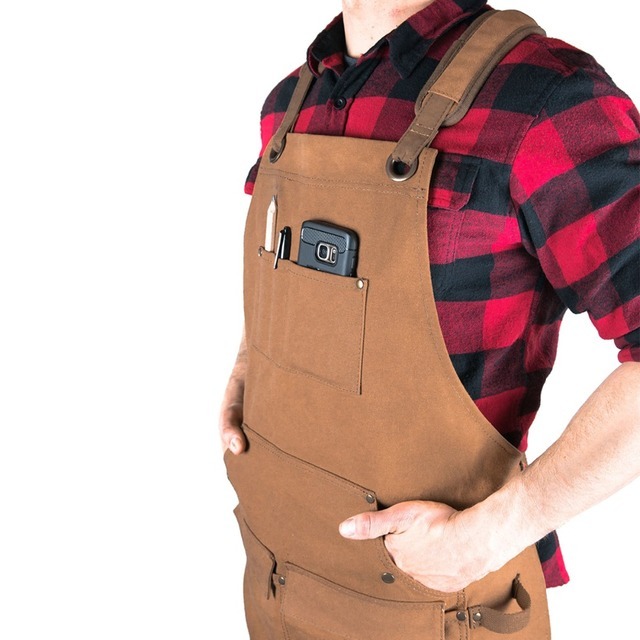 Built with padded straps, saw dust flaps over pockets, dual hammers loops, a quick release buckle fastener, and additional pencil pockets for all-day comfort. Brown color hides saw dust and evokes that rugged look! BUILT-TO-LAST: Build quality that imitators can’t match! 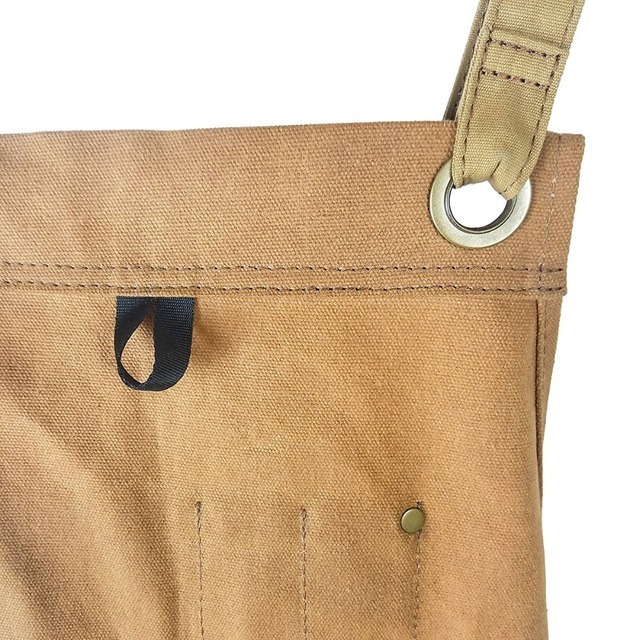 Handcrafted from water resistant & rugged 16 oz waxed canvas. Reinforced with heavy-weight brass grommets and rivets. 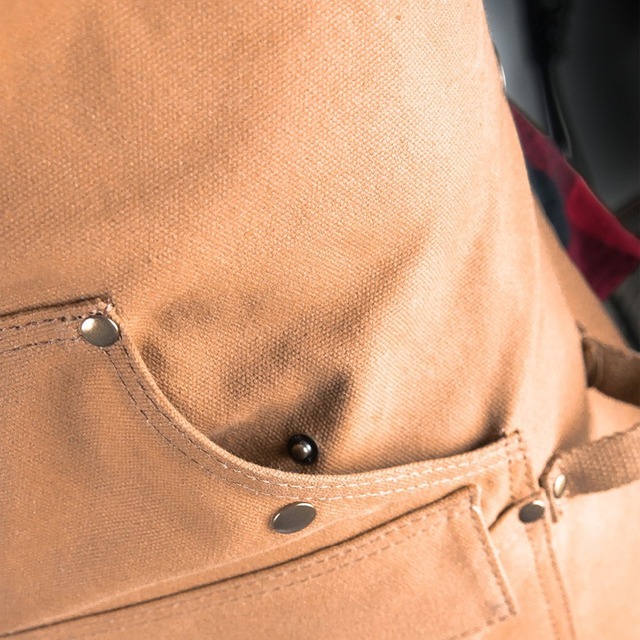 Double stitched tool pockets and thick top and bottom hems for strength and structure. ALL DAY COMFORT + CUSTOMIZED FIT: Prevent neck pain with padded (removable) cross back straps. 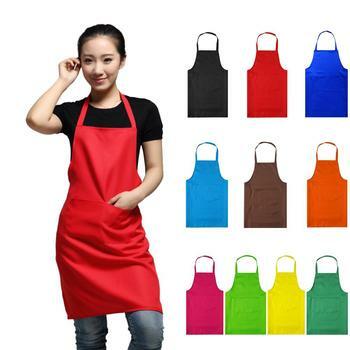 Full coverage bib apron is 27 inches wide x 34 inches tall for unisex sizing (recommended for 5′ 2″ or taller). Grommets + long straps + buckle allow for a range of adjustments up to a 50 inch waist! 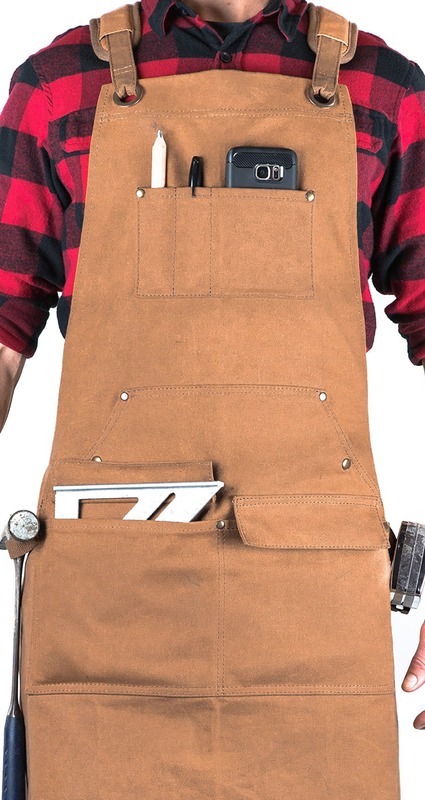 TOOL POCKETS & LOOPS: Dust flaps protect large, easy access tools/accessories pockets in front (8 x 6.5 inch each, fits carpenter’s square). Quick access cell phone/pencil pockets on front chest. Large “kangaroo” style hand pocket with snap closures. Dual hammer loops with rivets. Hanging loop on back of bib. 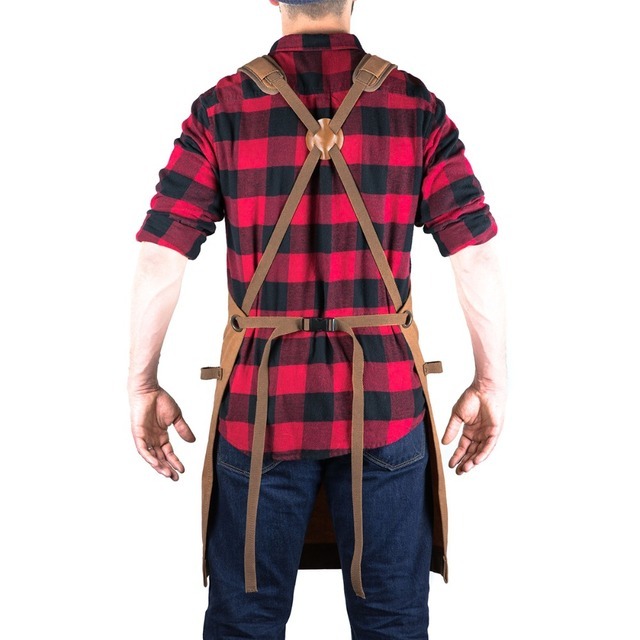 BROAD USE: Commercial grade man apron, woodshop apron for carpenters, woodworking tools and accessories, woodshop, workshop, garage, machinist apron, lathe work, leatherwork, metalwork, light welding, metalsmith, blacksmith, gunsmith, wood craft, xl men’s apron, etc. Unique gift for men & fathers.